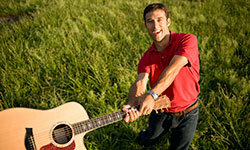 Steve Roslonek of SteveSongs writes and performs award-winning music for kids that mixes up participatory songs, clever stories and great melodies to create an entertaining and educational musical journey for kids. 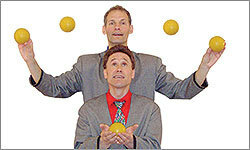 Performing as the Gizmo Guys, Allan Jacobs and Barrett Felker's rapid-fire act exhilarates and inspires sidesplitting laughter in audience members of all ages. Debbie and Friends' performances include a variety of styles, from straight-ahead pop, to country, to rock, to reggae. 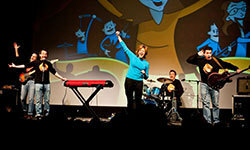 The group's songs are engaging, interactive, fun, and educational. The StepCrew is a new dance production featuring the worlds top talents in Irish stepdancing, Ottawa Valley stepdancing, and modern tap. 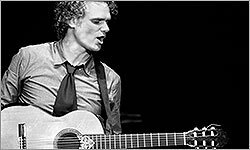 Jesse Cook is a guitarist, producer, and composer who specializes in nuevo flamenco music, which combines rumba, jazz, and world music influences. 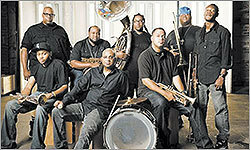 Back for their second Summer Arts Weekend, the Soul Rebels have built a career around an eclectic live show that harnesses the power of horns and drums in the party like atmosphere of a dance club. 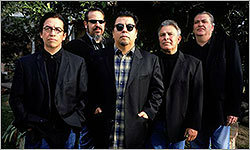 This award-winning band -- called an American Chicano rock band -- derives its sound from a mix of rock'n'roll, Tex Mex, R&B, blues, soul, and traditional music.